Having a study strategy in place is one of the key factors to ensuring actuarial exam success. Actually, I believe that if all the right elements are in place and implemented properly, exam success is almost guaranteed. Usually when students think of an exam study strategy though, they think of just a study schedule. A study schedule, of course, is a very important part of your strategy but that alone won’t necessarily get you the results you’re hoping for. 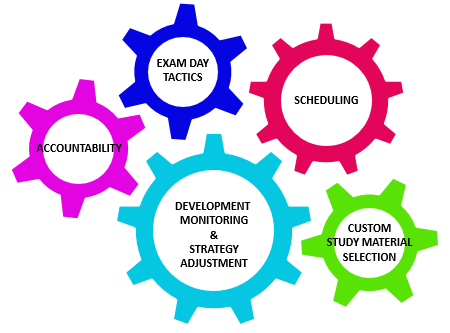 That’s why the study strategies that I create for my Exam P and Exam FM study strategy consulting clients include 5 critical elements that all connect to create a completely customized strategy that gives them the absolute best chance of passing. The materials that you decide to use during your study period should be chosen depending on your unique learning style, budget and schedule. For example, the ACTEX study manuals are some of the best resources for anyone that likes to be able to read about a concept or topic and then be able to see it visually with a diagram or image. The study manuals are also great for anyone whose budget for study materials may not be able to cover the cost of more expensive options. This is where your study schedule fits in. I advise having 2 different types of schedules. A “study roadmap” is a high-level, week-by-week overview of what you’ll be accomplishing during each week of your study period. Actually, I have a free 12-week sample roadmap on my website. A “daily goals calendar” is exactly as it sounds. It’s a calendar of specific goals that you aim to achieve each day of your study period. These goals should align with the high-level tasks that you’ve set in your study roadmap. This is an element that almost all self-made study strategies lack for two reasons. First is that many students don’t realize the importance of it. It’s extremely easy to procrastinate and fall behind on studying when you’ve got months to study and no one but yourself to keep you accountable. It often results in an undesirable “crunch time” as exam day gets closer. Second is that in the past it has been difficult to find someone to act as an accountability partner. Now, with study strategy consulting, it’s a much easier because you have someone working together with you at each step of the way. Adding accountability to your study strategy will be extremely beneficial because it will encourage you to stay on track without letting procrastination and other “stuff” get in the way of your studying. This is another element that is often overlooked and can actually be fairly difficult to do without the insight of an experienced mentor or consultant. Throughout your whole study period you should be tracking the difficulty of each topic and practice question you do. In later parts of your study period, you should use that information to adjust your strategy appropriately. It’s an important step in boosting your understanding of the exam topics. On exam day, there’s lots to think about. You’re under time pressure. You’ve got to sit and write for an entire 3 hours. You’re in a new place and you can’t refer to your study material for help at all. You may even be a little bit stressed. That’s why it should never be your first time doing anything on exam day. Everything you plan to do on exam day should be well practiced during your study period. Any exam day tips that you’ve been given should be practiced before exam day. You should do 3 hour timed practice exams. You should set up everything exactly as you plan to on exam day. Now that you know what a study strategy is, I’d love to work with you to create a completely customized study strategy that fits your budget, learning style, schedule and current understanding of the exam topics. ACTEX is now offering Etched Actuarial Study Strategy Consulting products online, including Study Strategy Consulting memberships, to create an unbeatable combination of the content that you need to study along with the custom study strategy to get it all done right. One-month subscriptions to Brea-Nicole's Etched Actuarial Study Strategy Consulting are now included with ACTEX & ASM Study Manuals for Exams P and FM. Brea-Nicole Fried, ASA, earned her Bachelor’s degree in Actuarial Science (Finance Option) from The University of Waterloo, in Ontario, Canada. She is currently writing the Life & Annuities FSA track, with the Life Pricing Exam passed and 2 modules completed. 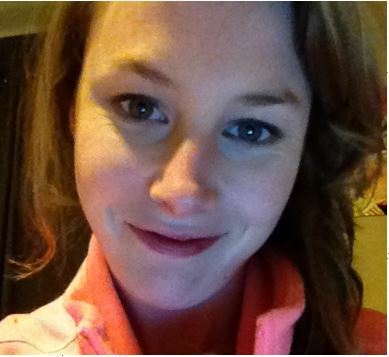 She works as an actuarial associate and has 3+ years of experience in S&R and Group valuation. She also offers exam coaching through her company Etched Actuarial Study Strategy Consulting. In " Data Science, eLearning, ACTEX News, actuarial programs, actuarial technical skills, Actuary, Continuing Education, Leadership, microinsurance, Passing Actuarial Exams, Predictive Analytics, professional development, Professionalism, Python, R, Retirement, soft skills, webinars "